So a few people have asked about the Promise Tree. With our first group of Rangers, we did a big joint one – there were only 5 girls so this was relatively easy. However, now we have a situation where I have bigger group, and sometimes when it’s only one or two new girls joining we don’t want to do an activity that as one large group. Last year, I found a craft on Pintrest that was aimed at learning about four seasons. I’ve adapted this to make it into a Promise Tree for individuals girls to make. Unfortunately I forgot to take pictures of the girls’ beautifully decorated and lettered tree booklets, so I’ve quickly made my own basic version to give you an idea of how it works. Forgive me, arts and crafts is NOT my forte! Fold a piece of paper in half, and draw half a tree. Then cut it out to make one whole tree. You should then have three identical blank trees. Put them together and staple them in the middle of the fold to make a booklet. Each page of the booklet can be used for each line of the Guide Promise. I usually make the trunk the line of the promise, and then say to the girls to make leaves with how they can apply that promise in their own lives. Essentially it is about what keeping the promise means to them. You can then decorate the front and back cover to make it more tree like. At the time we used stamp pens, glitter glue and all the stuff our “teenage Brownies” like to break out when crafting! Two weeks today, the Scottish Parliamentary elections take place. For the first time, 16 and 17 year olds will be allowed to vote to decide who represents them locally and regionally in our parliament. When we first started the Ranger group, it was just after the announcement that 16 and 17 year olds would be allowed to vote in the 2014 independence referendum. The girls were a little freaked out by this prospect, and several of them felt that they shouldn’t be allowed to vote (based mainly on how much they didn’t know). By the time the referendum came about, they were all able to make a decision based on their own opinions. One of our groups asked to have a night looking at the election. A few of them take Modern Studies, but despite this had confessions that they struggled to get their head around the Additional Member System way of voting that we use. I confessed to them how I had messed up at the polling station last time – I went in not realising that they’d decided to combine a few elections into one day and got so many pieces of paper I was unprepared for that I got flustered and confused and ended up putting a vote for someone that I wasn’t keen on by mistake. While eating birthday cake (we had another 16th birthday to celebrate!) we explained the two ballot papers and how they worked. One that is similar to the general election where they vote for one candidate from a party that is standing in their local constituency, and then the second one where they place a vote for which party should get one of the seven regional seats. After we’d got our head around that and the differences between the two, we gave each of the girls one of the political party manifestos (sadly there were two parties that hadn’t released them yet, so the leaders took those parties and worked out things from information we could get) and gave the girls 30 minutes to look through them before coming back and making a ‘campaign speech’ on behalf of each party. Then we got to ask questions. Some questions came up to us leaders on what parties meant by certain things (for example, Conservatives’ proposal of graduates paying £1,500 once they were in a decently paid job or Green Party’s proposal of creating jobs in renewable energy). We could have done with longer, but all in all I think the girls felt more able to make an informed choice at the polling station that they did at the beginning of the night. What has come out of this, is a request to do another political night where the girls can invent their own parties and manifestos. I also want to thank the makers of the Suffragette movie, and Girlguiding for offering the tickets they did when the film was released. A number of our girls have seen it, and been hugely impacted by it. It wasn’t that they didn’t take their right to vote seriously before, but I definitely see a change where they really appreciate that right. It gives me hope that perhaps we can get back to a place in our country where we are all politically engaged and willing to take the time to hold the people we vote into power accountable and know that our vote can make a difference. One of the great things about having volunteers going through leadership qualifications is that you get new ideas, reminded of old ideas and challenged about where you can improve on how you run your girlguiding programme. 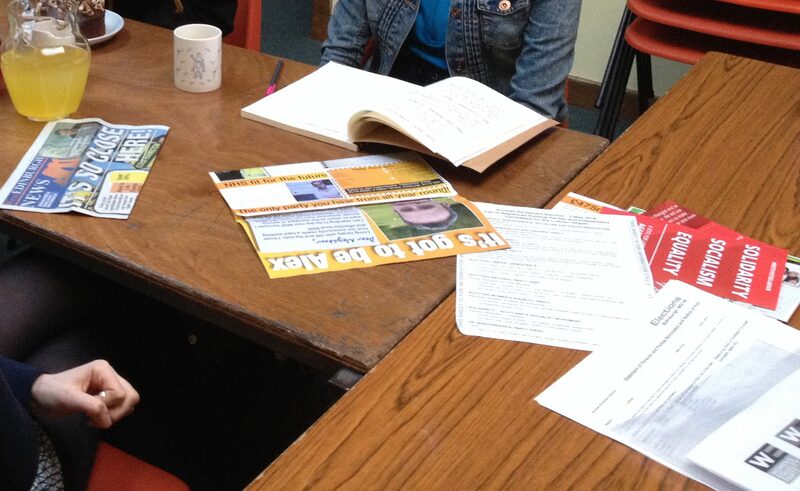 We have two young leaders going through their Young Leadership Qualification, and one of the sections talked about how they need to include Guides in running of the unit and having a Patrol Leaders Council. The PLC is not something I experienced as a Guide (despite it being in both my Guide Handbooks) and not something we’ve really done before. We for sure always include the girls in planning – the patrols choose their own Go For Its, and we regularly ask them for ideas of how they want meetings to be and what they’d like to do. However because our unit has often been on the smaller side, it’s been more of a Brownie Pow Wow style than a PLC. This term, we decided to get the girls to discuss in their patrols what feedback they wanted to give us leaders about what we do in the unit, ideas for things they wanted to do and then told them their Patrol Leaders would be representing them in a meeting with the leaders. While a few leaders ran a game, one of us with the two Young Leaders spoke with the Patrol leaders – not just to get feedback from their patrols, but also to find out from them how they were finding being in leadership and how we could support them in facing some of the challenges that responsibility was giving them. It is definitely something we need to do more regularly and put into our planning as it was such a useful exercise. Why haven’t we been doing this?! The Patrol Leaders came up with an idea that surprised us (more on that in a future post!). The Guides want to work on some interest badges throughout the next couple of terms, so we will have a lot to talk about at our leaders planning meeting next week when the schools are off (again).